Airtel YouTube video streaming is a new data subscription plan from Airtel. MTN YouTube video streaming and also 9mobile rolled out free YouTube Video streaming to its subscribers, Airtel seems to have follow the trend just like the 25 Naira night browsing data plan that was rolled out by Airtel after MTN night Plan was introduced to its subscribers. Airtel, though was the first telecommunications network that introduced free Facebook with free basics , now we have 9Mobile (etisalat) Free Facebook and Glo Free Facebook or Facebook flex free or zero data packages. This is competition and I like it, I hope full and cheap data plan for other streaming services like Mobdro, Netflix and Hulu amongst others will be introduced to customers sooner rather than later. Unlike 9Mobile YouTube plan that can only be used at night, Airtel YouTube packs are design for you to choose from, it has both day and night plans. This Costs 400 Naira and valid for 30days. The data is capped at 600MB, so yes ,its not unlimited. Available only at night between the hours of 1am to 5am everyday. 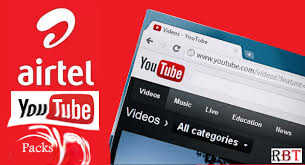 This Airtel streaming data plan gives subscribers free access to YouTube videos when they purchase or subscribe to any of Airtel Android monthly data plan, just like 9Mobile YouTube data offer. N300 / 300MB / 7 Days. N150 / 300MB / 7 Days. How To Activate "9Mobile Free YouTube Video Streaming" Now !